Where can I get a cheap necklace? You can get a cheap necklace from Amazon, ebay and other UK fashion retailers. Every day our community of bargain hunters look for the best jewellery deals and share discounted necklaces here. You can find crystal necklaces, silver, diamond and more. You may also be interested in a bargain bracelet or Tom's guide to cheap clothes. J.Rose Silver Pendant Necklace - £4.87 from Amazon! Choosing the right necklace can alter your look instantly. Necklaces can highlight your features, accentuate your neckline and can even change the shape of your body. With so many different styles, make and colours, it’s no wonder necklaces are one of Brits’ favourite jewellery accessories. Necklaces also make great gifts to your family and friends as well. 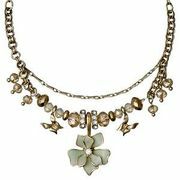 You can save time and effort trawling trough high street queues if you will opt to shop online for necklaces. Plus you can also take advantage of exclusive online only deals from most UK jewelry retailers. Here at Latest Deals you will find cheap necklace sale, deals, offers, promos, discount codes and voucher codes from Amazon, BrandAlley, eBay, Red Carpet Jewellers, Argos, The Jewel Hut and more! Our savvy team of money-saving experts and bargain hunters are always on the lookout to find the best possible cheap jewellery offers online to post. We have deals on everything from Necklace Pandora sale and Tiffany necklace offers to silver necklace and gold pendant necklace promo codes. So if you’re looking for a special necklace for yourself or a necklace as a gift for a friend’s birthday or wedding anniversary but on a budget, then you’ve come to the right place. Plus our quick guide to choosing the best necklaces will surely help. When a jewellery is displayed in a shop, surrounded by numerous of other designs all dazzling you at the same time, it can be overwhelming to pick out the perfect one. Take that process online and on the best websites, you will find a curated selection of pieces tailored to your budget and style preferences, all in a few simple clicks. You’ll find that buying necklaces online come with great price saving advantages. Since they don’t come with massive overheads of a high street shop, online jewellery shops in the UK can reduce their prices massively. Not only will you find necklace sale, but you can also get free or cheap delivery costs, presentation boxes and gift wrapping services as well. Here’s a list of some of the best UK site to buy jewelleries. The Jewel Hut is a dedicated online jewellery shop, offering fashion lovers the chance to purchase branded pieces at highly competitive prices. Since its launch in 2006, it has become one of the country’s leading online jewellery retailers and stocks some of the leading brands like Marc Jacobs, Thomas Sabo and Pandora. Asos is the one to beat when it comes to very affordable and fashion-led pieces. The retailer have quickly become the go-to destination for so-somethings. Their jewellery section includes designers like Vivienne Westwood, Wolf & Moon and Ted Baker. Net-a-Porter is one of the world’s leading designer of clothing, but they also have an amazing range of jewellery offerings. Their website’s jewellery section focuses on carefully selected array of brands and is broken down into categories for Fashion, Fine and Demi-Fine as well as designer and type. The site specializes in high-end finds by the prices enormously vary from £20 to £37,000, so you’re sure to find something for your budget. Astley Clarke Ltd is a London-based jewellery that designs all their own collection in their studio. They also collaborate with international guest designers. 27,000. If your budget is at the lower end, make sure to search their collection by price. The site also has a Drop a Hint feature which lets you e-mail links of products you’re lusting after, this is perfect for when you know exactly what you’d like to receive on your birthday. The retailer is popular for their iconic Chakra collection which paved way for jewellery focusing on wellness. Balancing spirituality and aesthetic, every Charkra is represented by a different symbol denoting an intrinsic meaning. They cover everything from necklaces to earrings and bracelets to rings, Daisy has quickly become a firm favourite among celebrities such as Cara Delevingne, Rita Ora and Ellie Goulding. If you’re looking for something that’s more than just an accessory, this is the site to visit. This is a high-end destination and has been around for more than 25 years with more than 400 established and up-and-coming designers. They have an extensive price range and you can buy necklaces here with prices ranging anywhere from £65 to £625. If you’re buying a necklace for yourself you’ll probably have something in mind already. Apowerful statement necklace might be ablet to lift your spirits and ooze with confidence or something a bit more subtle like a pretty gold necklace with your birthmonth’s gemstone. If you’re choosing a necklace for someone else, consider something they already wear. For example if they wear silver earrings then a silver necklace will be the ideal complementary jewellery. Matching metals is as trending as matching gemstones. If you love the colour blue then opt for a sapphire necklace or perhaps a necklace with sparkling blue beads. 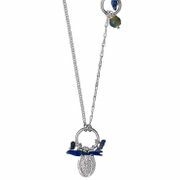 Charming sapphire necklaces are used to celebrate 45th wedding anniversaries, while necklaces with different gemstones represent other anniversary and birthday years as well. Furthermore, consider the style of your necklace, is it designed to be worn with a blouse or shirt or over a jumper. Long necklaces are designed to be trebled or doubled to create different effects and always look striking with polo neck jumpers. Shorter necklaces and chokers on the other hand work great with t-shirts and dresses. 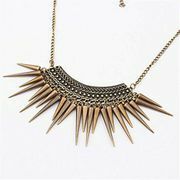 You’ll find plenty of cheap necklaces here at Latest Deals that comes in all types and sizes that will fit your budget. Take the time to browse and compare until you find the right necklace deal for yourself or to give as a gift. Collar Length 30-33cm. Should sit snugly around the neck and normally worn as evening or bridal jewellery. You can match it with a multi-strand bracelet. Choker Length 35-42cm. Lies just over your collarbone to complement your neckline. Princess Length 65-90cm. The most popular necklace length and lies just about 2cm below your collarbone. Opera Length 65-90cm. A dramatic length that works with a more casual and modern style.